The Concertante Music for Vibraphone, Marimbaphone and Strings Op. 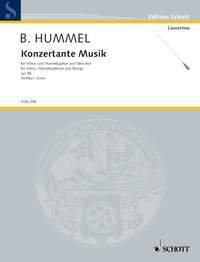 86, a commission by the chamber orchestra Merck on the occasion of its 20th anniversary, was composed between July and September 1986. A remarkable novelty of the work is the special positioning of the vibraphone and marimbaphone which allows the soloist to operate both instruments in a similar manner to an organist playing on different manuals. This aspect is naturally incorporated into substantial passages of the composition with virtuoso transitions from one instrument to the other and the tonal amalgamation of both instruments. The three-movement work juxtaposes the solo part with a 13-part string ensemble, also providing opportunities for contrast and amalgamation. In the first movement Moderate, rhapsodic formulations alternate with lyrical-ariosa sections and light and dark colours are contrasted within a small space. Three episodes with four-part marimba tremoli and two cadenza-like transition passages function as structural divisions. The second movement, Allegro, is characterised by a pulsating, relentless rhythmic motion in confrontation with a graceful Tempo di valse. Both types of movement are also juxtaposed in the brief solo cadenza. The rondo-like alternation with ever new twists and turns dies away suddenly in extreme pianissimo. The third movement Recitative - Chorale - Finale initially provides the soloist with the opportunity for "free speech". Chorale-like sections (marimba) with episodes (vibraphone) take on a tranquil character against the high pedal points in the violins. The directly ensuing finale (Presto) provides the soloist with multiple opportunities for virtuoso development. The intermediate somewhat grotesque march episode has a relaxing effect. All elements of this movement are incorporated into the extensive cadenza. The Presto continues and new variations are added; the musical impetus is variously harnessed by fermatas and reminiscences. An ironical conclusion is attached to the culminating bars of the coda. I hope that this work conveys something of the high spirits which I experienced during the composition of my opus 86.